H. Rick Bamman - hbamman@shawmedia.com Johnsburg mom Susan Mlynski wrote a children's book dedicated to her son, Ryan, who died of cancer at age 7. The book is illustrated by her son's former classmates, and all proceeds will be donated to St. Jude's Children's Hospital. H. Rick Bamman - hbamman@shawmedia.com Johnsburg mother of eleven Susan Mlynski wrote a children's book dedicated to her son, Ryan, who died of cancer at age 7. The book is illustrated by her son's former classmates, and all proceeds will be donated to St. Jude's Children's Hospital. 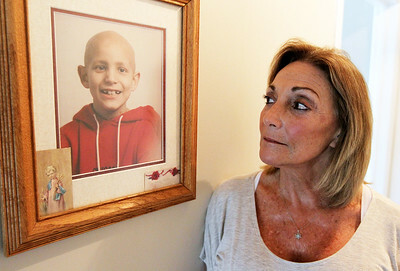 Johnsburg mom Susan Mlynski wrote a children's book dedicated to her son, Ryan, who died of cancer at age 7. The book is illustrated by her son's former classmates, and all proceeds will be donated to St. Jude's Children's Hospital.